katnaper's den: Should... but later on. I recently posted about my new Resin boy but I changed my mind. Oh, he's still on my list but he might have to wait for next year. Let's just say I got sidetracked by fellow ManikaManila member moptech's pilgrimage to Dollieh-land Korea. 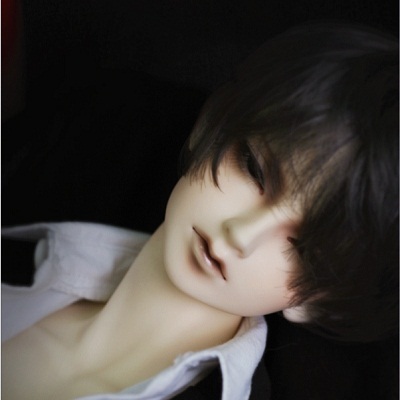 As they say, curiosity killed the cat, in this case curiosity caused the katnaper to go gaga over nosebleed inducing Kyul, Crobidoll's B Line Limited B boy. I found someone who's got him in his model body, which I just love! <3 <3 <3 Talk about 68cm of dollieh scrumptiousness *phew* give the boy some glasses and he'll be Kyoya-esque in all his megane glory (It's obvious I'm not a fan of Ouran High School Host Club, eh? *grins* ). Now, I just need to find a doll that fits Tamaki since I already have an idea for Haruhi. ;P What the hay is it with these dolls? OMG! I too am madly in love with this boy! Unlucky for me that I don;t have money to buy the full doll. I only have his head on lay-away and thinking of dong a hybrid. Kudos for getting him on that to die for model B line body!!! Thank you. I was just glad that he was available on layaway or else I wouldn't have been able to get him. :-) Congrats on getting yours. What body where you planning to put him on? I'm planning on getting him the Loongsoul 70CM+ body. I think that body is very similar-looking with the Crobi male B-line bod. I hope it matches well. Good luck with him then. I have 3 more payments left and he'll be home soon. :D Hope to see pics of your boy!